Speed Limit: 5 MPH! If caught speeding, you must park at the park entrance and walk in. Visitors: Fees on Saturdays and Holiday Sundays are $5.00 per person, children under 16 free. Everyone MUST register in the office before going to visit you on your site. Your visitors are your responsibility. They must leave by 10:00 PM. Guests are allowed in the park from 9:30 AM - 10:00 PM, but cannot come into the park after 7:00 PM. All visitors must register at the office or will be asked to leave! Check-In, Check-Out Times: Check-in is anytime after 2:00 PM, Check out is 11:00 AM. Quiet Hours: 11:00 PM to 7:00 AM. Please do not leave before 7:00 AM on the day of your departure. We Do Not Have Children’s Activities: There is no Playground, Rec Hall, or Pool. Our campground caters to adults. Outgoing Mail: Mail should be placed in the moose mail box at the office. Messages: Emergency messages will be delivered to your site. All other messages, you can pick up at the office. MEDICAL: Emergency medical services available 24 hours a day at Northeastern VT Regional Hospital nearby or by calling 911. Tell them you are at 2870 Portland Street, Saint Johnsbury, VT. Please remember, your pet is on vacation also, so please make sure their vacation is just as wonderful as yours. They need to be on a leash at ALL times to and from your car/RV, and you need to pick up after your pet. DO NOT leave your pets unattended, it is not fair to them or your neighbors. Barking is not acceptable, and leases are not to exceed 8 feet. If you are caught not picking up after your dog, you will be fined $25. If you see anyone not picking up after their dog, you will get that $25. Please do not tie pets to trees and do not cut trees or shrubs. Visitors are NOT allowed to bring in their pets. 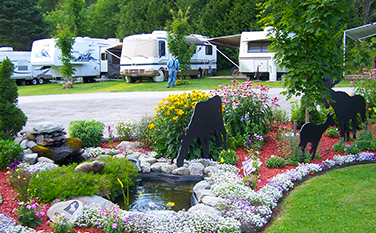 All cats must remain in your RV, not loose in the campground. If outside, they must be on a leash. Do not drive on the grass other than to or from your site. Between the sites are plastic septic tanks that are breakable. All children riding bicycles must wear a helmet (up to 16 years old), and bikes must be parked when the light comes on (dusk) behind entrance moose by the turnaround up front. Please, no clotheslines. If you need to dry your clothing, the laundry is next to the bathhouse. 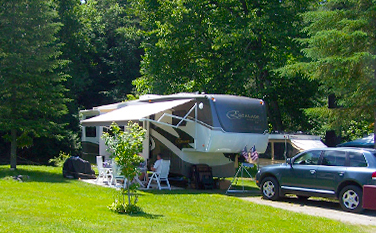 Also, do not hang anything from our trees, your RV to a post, anywhere in the campground. Articles may be placed or offered for sale on the grounds only with permission from the office. 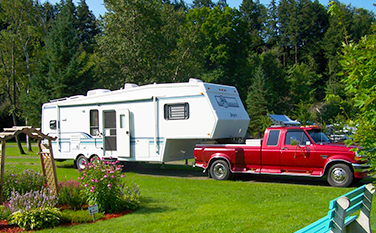 NO WASHING OF RVS. You can rinse the front to get the bugs off, but no further. Place trash in trash bags and deposit in the dumpster behind the pavilion. NO chairs, rugs, wood, appliances. Please recycle. 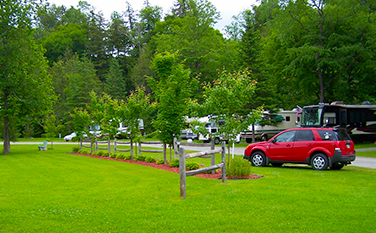 The campground road is a one-way road, if you cannot read the signs, you are going the wrong way! If you are in the middle pull-thru sites, NO RUGS on the grass. We would like to keep the grass. Please do not park or drive motorcycles on the lawns on any sites, they are too heavy and will collapse our septic tanks and our leach fields. Keep them on the dirt pad or in designated parking areas. Please remember, even though this is a campground that caters to adults, disorderly conduct, intoxication, obscenities, indecency, unsafe or unsanitary acts are not permitted. You will be asked to leave if this gets out of hand. NO REFUNDS FOR THIS! Please do not run your generators here in the park unless there is a power failure. Marijuana smoking, although permitted by the State of Vermont; is restricted to the interior of your RV while parked on this private property. It will not be tolerated in the park. We do not allow motorized transportation, such as golf carts, hover boards, Segway, etc. in the Campground. Drones are not permitted. Click on the image below to download a PDF version of our map. Map © 2018, Southeast Publications.